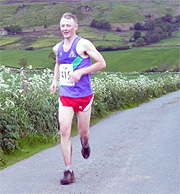 Getting a taste from my previous escapade, Gareth Huxley, young Ryan ‘The Kid’ Hall and myself headed to the quaint village of Ainthorpe to participate in the Fox & Hounds Chase Fell run on Tuesday evening 17th May. 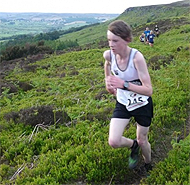 Young Ryan intended on competing within the Junior event which was recorded as 3miles whilst Gareth and myself were to compete in the senior event consisting of 8.8 miles 1500ft climb. Upon registration the friendly chap took one look at Ryan, scoffed a little and asked “Don’t you fancy the senior race son”, which Ryan responded with much delight “Can I, yes please”. Ryan’s main concern was not at the pending challenge but what would Dave Anderson say when he found out. Without boring you I can only say the route was spectacular, covering open moorland, in track’s that would test the most nimblest of sheep (what do you mean, how would I know?!?!?!). Running through the heather was draining on the legs, navigating the ravines made you question your sanity, and scrambling up the climbs on all fours…well you could only chuckle to yourself. With Gareth again way out in front and finishing in a envious 8th position, I managed to improve my position during the last 300 meters which was on road, downhill (strange how fell runners seem to run faster running through knee high heather than tarmac) and finished 14th but the star of the show was Ryan. A sprinting finish saw him swoop past half a dozen, finishing in a position of 45th out of 83 finishers. An absolutely marvellous effort and may also be worth the bollocking he gets from Dave. Great report from Mark! It is tempting to join you on a future fell run. How was the real ale after the finish? Wow Mark, you look 30 years younger in this photograph compared to the one a few weeks ago. Whats the secret? Horlicks, the kid and Gareth well ran lads , was the tbh top in the wash that night though Gareth??? Well done Ryan, you are not shy of a challenge! Most of the course was round narrow tracks through clingy heather, so it was tough going for a midweek outing. Re the vest- this is an NFR vest, who I joined a while back just for fell races, but if we could pull a team together (4 runners), then I will wear the black and white. Next race is at Osmotherley on Tuesday 31st May. 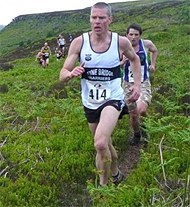 How do fellrunners go faster in bog/heather than on a road? This defies the laws of physics! Beer review- Mark and I (Ryan had Coke) both tried the Theakstons Lightfoot, which was a superb pint. A return to form from the Masham brewer after years in the doldrums following the takeover by S&N, from whom they have now freed themselves.